Sunset view of Lake Tashmoo. Upstairs living area, open area with kitchen in background. View of dining area from living room. Kitchen, adjoining upstairs living area. Downstairs half-bath, opening to outdoor shower. Main house bedroom #1 facing Lake Tashmoo, queen bed. Main house bedroom #2 facing Lake Tashmoo, queen bed. Bedroom with two twins, downstairs, main house. Upstairs bedroom, one queen with its own full bath. Guest house, with screened in porch. Guest house bedroom, full-size bed. A private small beach right out front is just what you need to have a perfect vacation! 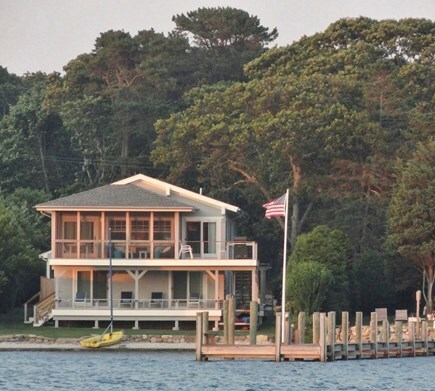 This beautiful, remodeled in 2012 6 bedroom, 4 bathroom (plus 2 outdoor showers), waterfront compound is set directly on secluded Lake Tashmoo, walking distance from Main Street Vineyard Haven. The main house features include a chef's kitchen with stainless appliances, a screened porch overlooking Lake Tashmoo, an open concept upper-level living area with spectacular views, 4 bedrooms, 3 baths, and an outdoor shower. A cozy guest cottage across the lawn includes 2 bedrooms, 1 bath, an outdoor shower, kitchen, cathedral ceilings, and a screened-in porch. Professionally landscaped, private beach. A mooring is also available if you have a boat. Kayaks and life jackets are available for your use. The property sits at the end of a one-and-a half acre wooded driveway approximately one mile from the charming town of Vineyard Haven. Additional pricing info: $300 cleaning and trash pickup, State and local taxes of 11.7% will apply. My husband and I and our two sons have been coming to MV for many, many years. In fact, in my husband's family, going back five generations. We used to visit a family bunkhouse on another part of the island, but we went out on our own in 1999 to establish our own place, with our own memories -- and we have accomplished that goal in a major way! I grew up in LA, my husband in Boston and we met in New Mexico where we lived for over 30 years. We moved to Florida in 2012 for a job, and also to get a little closer to our paradise on Lake Tashmoo. I'm an artist, and I draw a lot of inspiration from my time on MV and around our home on Lake Tashmoo. First and foremost, this is our home away from home when we're not in Florida. Our children have been raised on the beach in front of the house. We've been renting our house since 1999 and the house has gone through many changes, with a complete renovation from the studs up in 2012. We've been fortunate to have had several loyal families come year after year and stay in the house. There are guests that have had children that have grown up coming to our Lake Tashmoo house and everyone unanimously says it feels like home. The greatest assets are the sunsets, the lake and the peace one finds hanging out on the screened-in upper deck. Not to mention waking up in one of the two bedrooms downstairs in the main house, opening the curtains to the sunrise over the lake, birds singing and a warm breeze. Perfection! 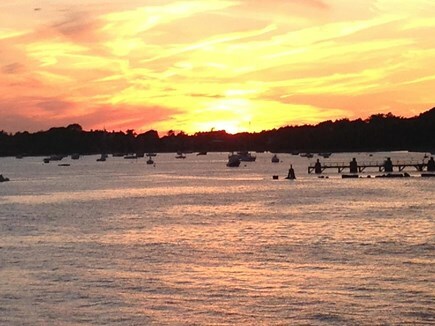 Vineyard Haven has the best shopping on all the island and there's a quaint little movie theater, live theater, Stop-n-Shop and some excellent restaurants. VH is very relaxed and friendly, and it doesn't have attitude. VH is a mile from the house and it's a wonderful walk or bike ride (you will have to rent bikes if that's your wish). You can walk a direct route, or go all the way around West Chop for a longer hike. Mink Meadows Golf Course is close by and open to the public, and there are public tennis courts within walking distance. The Mansion House Hotel in VH has a health club and spa, which we use regularly when we are there. We always go to the Black Dog and the Waterside for breakfast, and recommend you do that too!